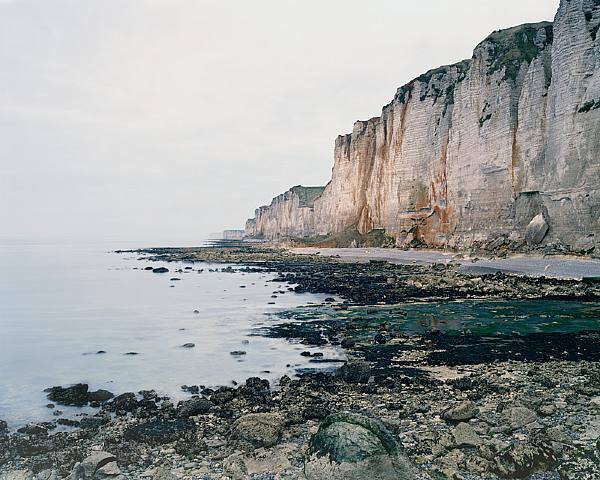 Jem Southam is known for his series of colour landscape photographs, taken mainly within the South West of England where he lives and works. He re-visits sites over many years, documenting the changes however slight. This method reveals the fragile balance between nature and our interventions into a landscape. He uses a large format camera to produce 8 x 10 inch (20.5 x 25.5 cm) negatives that record a high level of detail. Text is also important to him, and many of the series result in both an exhibition and a book. Upton Pyne details the evolution of a small pond, created as a result of industrial waste on the site of a former manganese mine near his home in Cornwall. This series of images taken between 1996-2003 show how individuals strive to make a difference, recreating the pond as an alternative Garden of Eden. From November 2010, over a five month period he took a series of photographs along the river Exe in Devon, documenting the path of winter. Rockfalls is a series showing a section of the coastline of Normandy in northern France where the cliffs change shape according to the weather, affected by climate change and coastal erosion. The Red River is a sequence of 50 photographs that follows a small stream in the West of Cornwall from its source to the sea. Taken over a period of six years, the stream runs through areas of moorland, farming, tin mining and beaches as it reaches the sea. What I see in Mr. Southam’s images is a meticulous use of found materials to produce complex works of abstract design. They are like the nonobjective paintings of mid-century except, of course, they are objective. Or they are like highly patterned Islamic art, except the patterns do not recur. Colors, shapes, and scale are the elements of these sophisticated compositions. Another element Mr. Southam incorporates, by way of providing a “plot,” is time. One picture was taken at Senneville-sur-Fecamp in February 2006, and another was taken from the same spot in April of that year. The first was shot at a low tide that exposed the rocky shelf abutting the cliffs and gave the scene a brownish cast; the second at high tide, when a wide swath of seaweed gave it a bluish green tint. Between the picture taken at Vaucottes in November 2005 and the one taken in February 2006, the disposition of the black pebbles on the beach changed considerably. The high cliff jutting seaward in the distance seems to be the same in each, but we understand that, given eons, it, too, will go. My current work is complex. I usually am working on 8/10/12 pieces at the same time – though one or two will always be uppermost. If I had a wish, it is that I make pictures which are engrossing to look at. I like to make pictures that are complex to look at, So they provoke someone looking at them to spend time with them, to let the pictures infiltrate their imaginations. His photographic practice is almost meditative in feel; the act of returning again and again to the same places is something most of us can feel an empathy with. We all have those landscapes that should remain the same in our heads, as our memory of them, but which inevitably shift and change on our return. Jem Southam shows us this, through his deep contemplation of the English landscape.